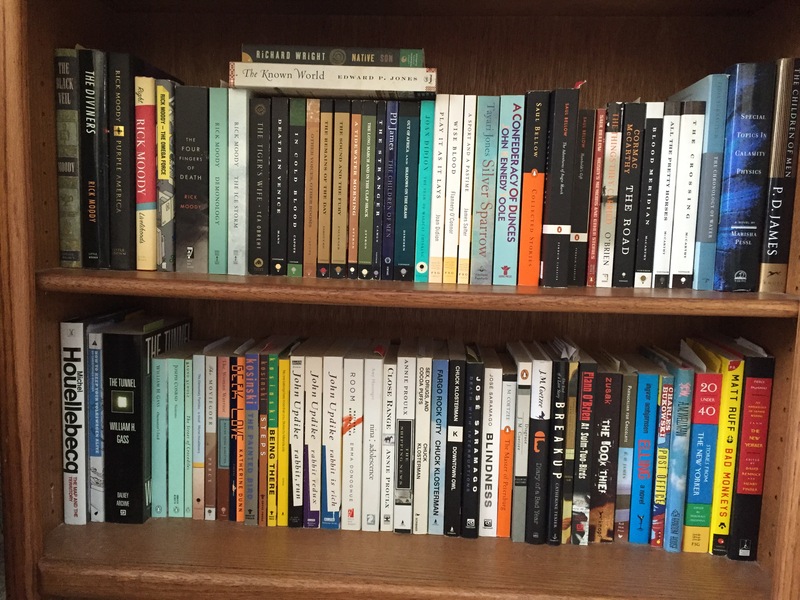 I like my indie lit to occupy the same shelf as greats like Toni Morrison, Marilyn Robinson, Fitzgerald, and Hemingway. This is where you’ll find work from Michael J. Seidlinger, Kyle Muntz, Eddy Rathke, Annam Manthiram, Matt Bell, Benjamin Percy, J.A. Tyler, Brian Oliu, and David Atkinson (et al). 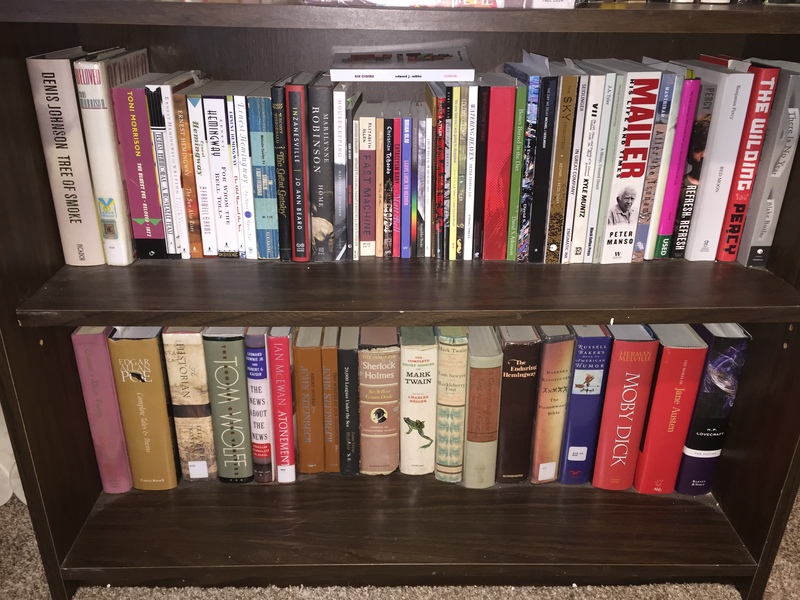 The bottom shelf is full of library sale rescues! Lots of Ursula K Le Guin and Paul Auster on this shelf, as well as Cory Doctorow, Nicholson Baker, and Robert Heinlein. 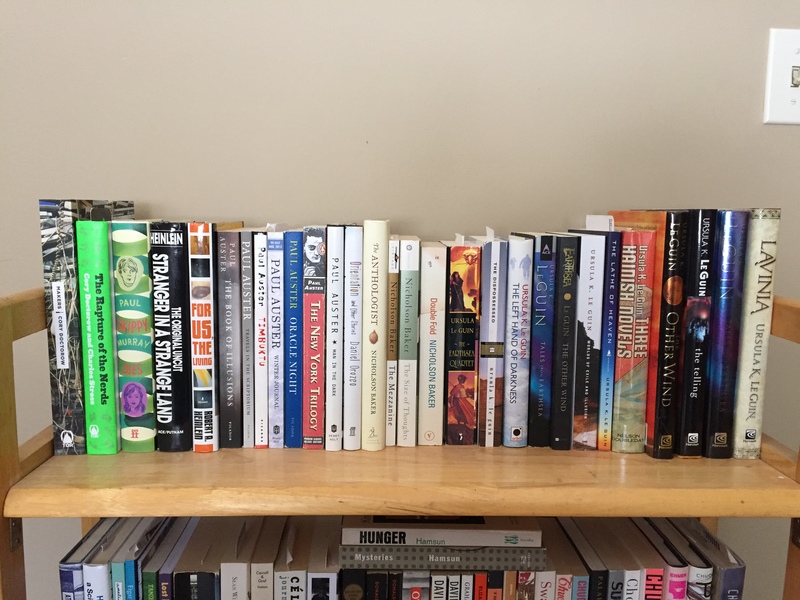 Chuck Palahniuk is featured heavily on this shelf, but so are plenty of other great authors: Rivka Galchen, Charles Yu, Ben Tanzer, Sean Wilsey, Céline, Heidi Julavits, Ovid, Karen Russell, and horizontally, Knut Hamsun. Lots of Rick Moody here! 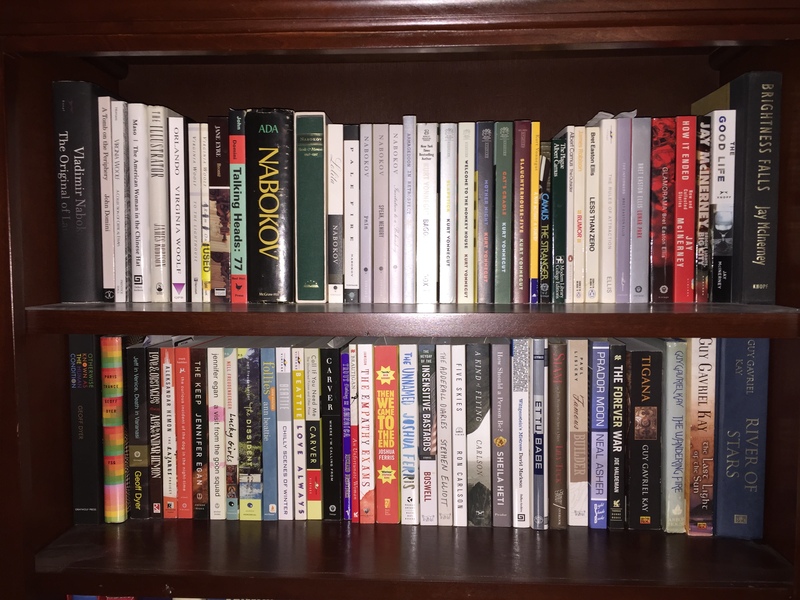 Also of note: Joan Didion, Richard Wright, Edward P. Jones, Truman Capote, Saul Bellow, Tayari Jones, and Cormac McCarthy. 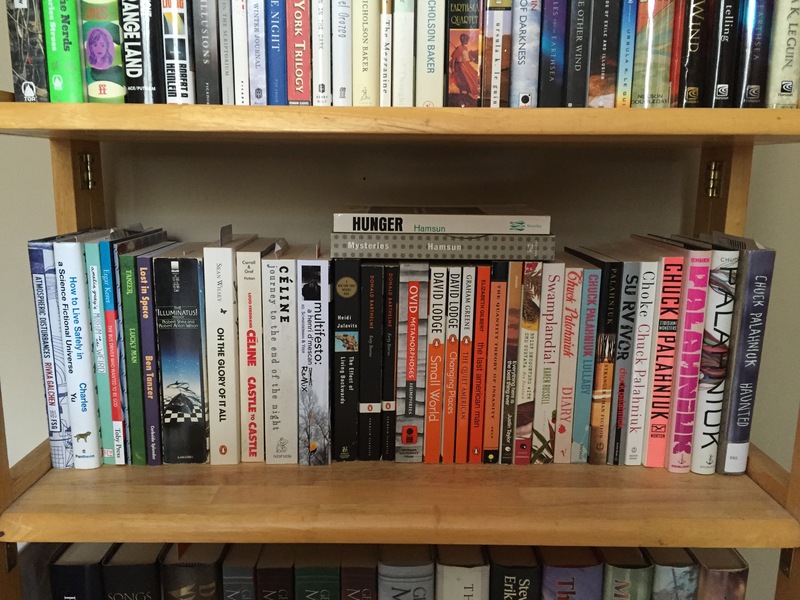 The next shelf has some good titles from William Gass, Jerzy Kosinski, Chuck Klosterman, Jose Saramago, J.M. Coetzee, and Michel Houellebecq. 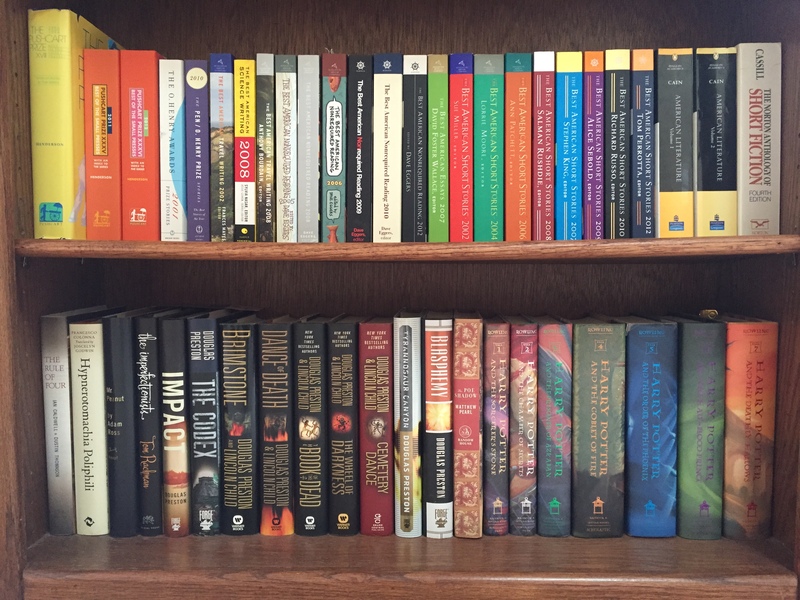 Old sci-fi and fantasy mass-market paperbacks here — books from Baxter to Tolkien, literally! This is where lots of essays and short stories live! Lots of stuff from Best American, Pen O. Henry, Norton, and the good folks at Pushcart. Shelf 2 is lots of Harry Potter and other books of a more mass-market fare, but in hardcover this time! Do you like Nabokov? I do (clearly). 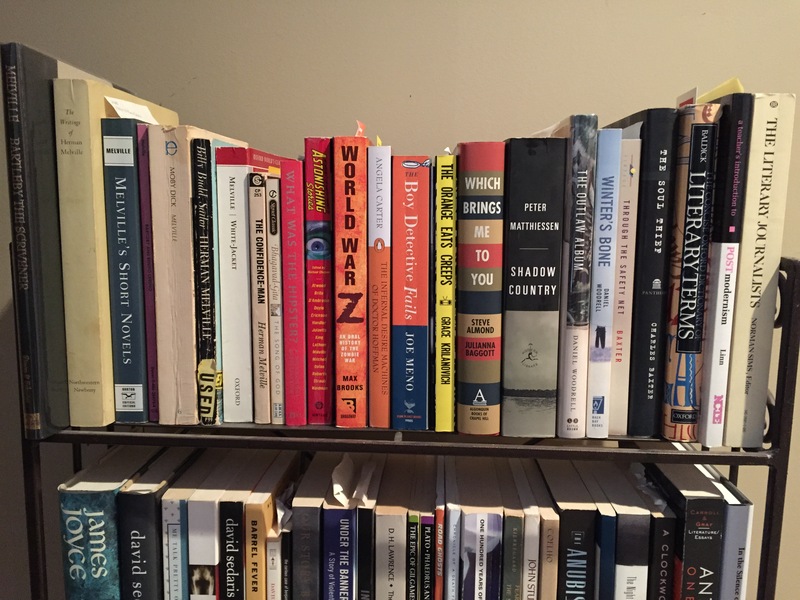 Kurt Vonnegut also shares this space with Vlad, as well as Virginia Woolf, Albert Camus, Bret Easton Ellis and Jay McInerney. 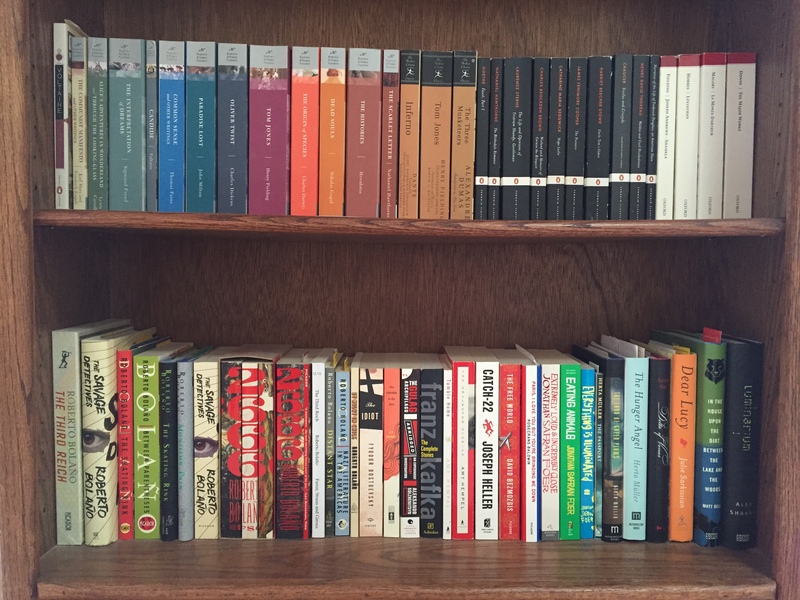 There is another member of the Brat Pack on the next shelf, Ann Beattie, as well as Geoff Dyer, Raymond Carver, Jennifer Egan, Aleksandar Hemon, Joshua Ferris, Richard Brautigan, Guy Gavriel Kay, and a few others. 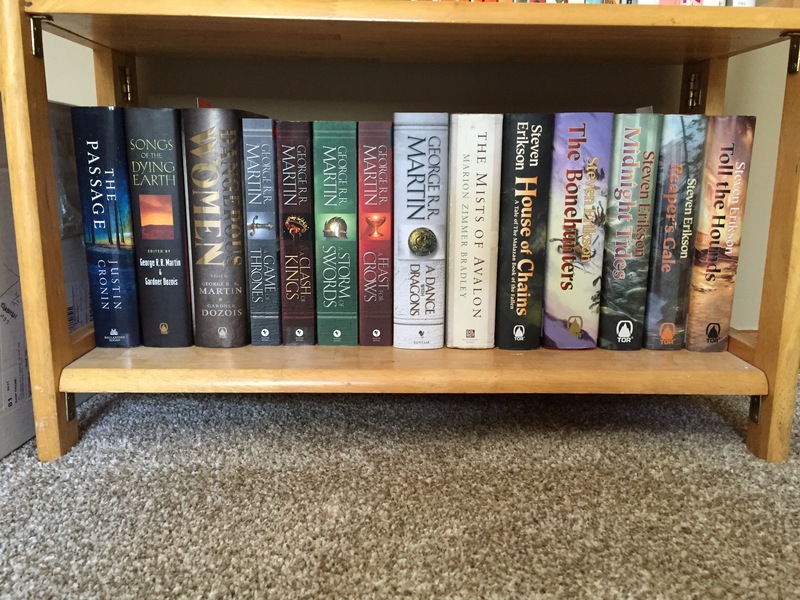 This is a hardcover fantasy shelf, for all intents and purposes. George R.R. 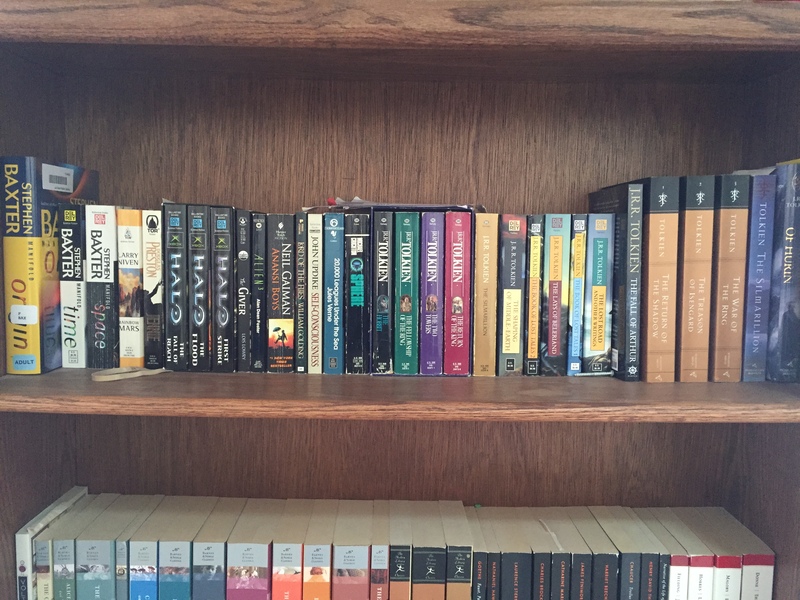 Martin, Marion Zimmer Bradley, and more of Steven Erikson’s Malazan Books of the Fallen, and two cool anthologies edited by Martin. 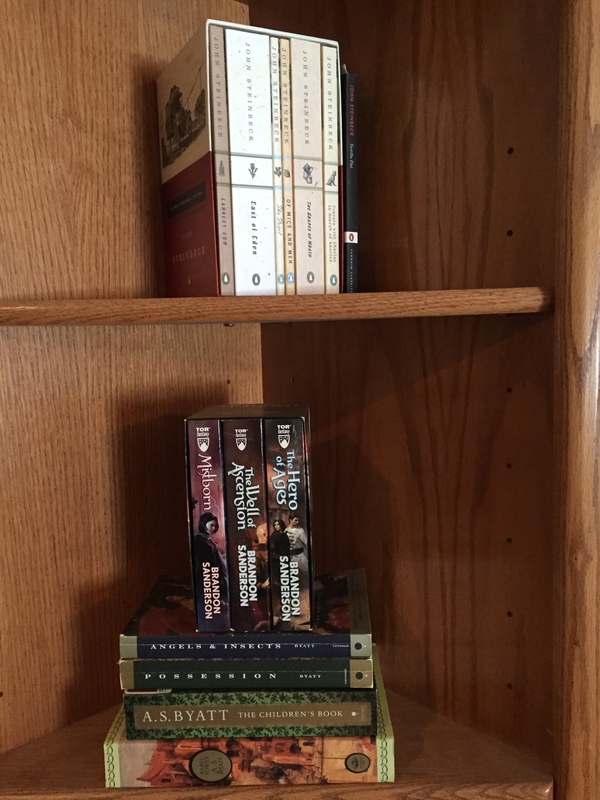 This is a little corner shelf that’s home to John Steinbeck, A.S. Byatt, and Brandon Sanderson. You know, just because. 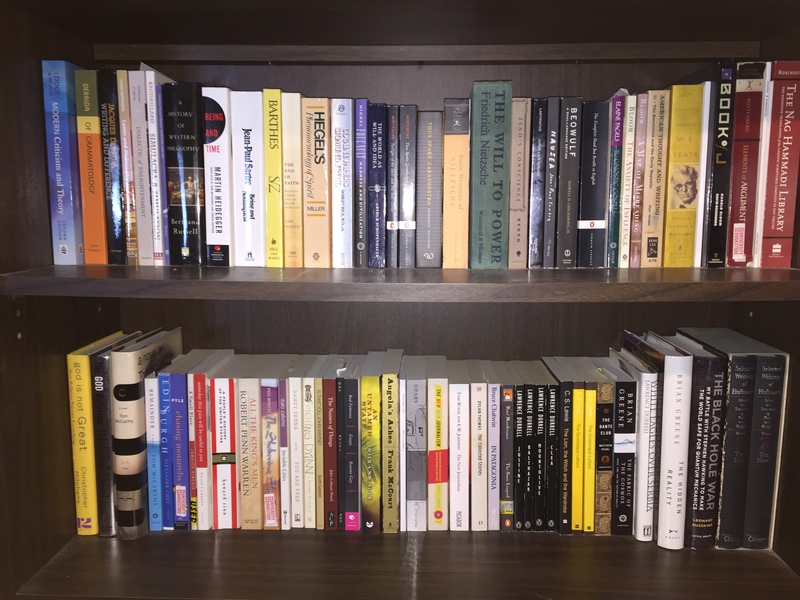 Most of the rest of my books are in boxes (or at work). But these 2 posts provide a pretty good idea of what you’ll find at my house. I’ve got a little bit of everything!